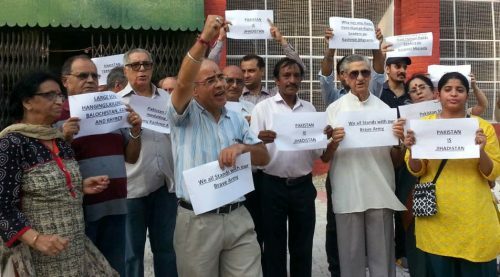 CHANDIGARH: A group of Kashmiri Pandits held a protest at Kashmir Bhawan here against Pakistan’s “interference” in the internal affairs of India and open “support” to terrorists. The protest led by the Kashmir Sahayak Sabha Chandigarh and Kashmir Pandit Sabha Panchkula which are central body for Kashmiri Pandits living in tricity. Kashmiri Pandits gathered mentioned that Pakistan first have to looks after its own Country which is now a failed Country and gross Human Rights violations going on in its Balochistan, Fata and Khyber Pakhtunkhwa areas in which large scale hangings and killings are occurring. “The protest was organised against Pakistan’s gross interference in the internal affairs of our country, as also Pakistan’s open support to known terrorists and their sympathizers in Kashmir,” said by Vijay Vaishnavi Ji President Kashmir Pandit Sabha Panchkula. They also mentioned that Why Human Rights Leaders now stands up on the killing of a Terrorist but till now no wording on the exodus of Kashmiri Pandits from the Valley. All started from JNU is still going on. Pakistan responsible for Kashmiri Pandits Exodus from Valley and it’s only due to Army that we are alive today. Sq. Ldr. (Retd.) B.L.Sadhu, V.N.Kaul and V.S. Kaul present along with around 50 Kashmiri Pandits. All Present on the occasion raised slogans in favour of Army and raised slogans “Pakistan Terroristan” “Pakistan is Jihadistan” and against Human Rights Leaders.